The breakdown of a marriage is undoubtedly a painful and life-changing event. But what could be more painful than finding out that you are still married even though you are supposed to have been divorced years ago? I was instructed recently by Mrs. A to claim maintenance for the child of her marriage to Mr. A who she had been ‘divorced’ from over three years before. According to her, Mr. A has been inconsistent with the maintenance payments. My first response was to ask for a copy of the order of court dissolving the marriage to have an idea of the arrangements made by the judge for the welfare of the child post-dissolution. What I saw next shocked me to the marrow. I saw a supposed order for ‘nullification’ of marriage which purportedly dissolved the marriage summarily without a trial and nullified the marriage from the day of celebration. For added measure, the marriage was supposedly dissolved on the ground of ‘incompatibility’ between the parties to the marriage which by the way lasted only two months. I was convinced that the order was suspicious and required further investigation. A few visits to the High Court registry confirmed my worst fear: This was a fake order. It was not granted by any court but by one of the growing army of fake divorce mercenaries What I found is a criminal racket that permeates the marriage and High Court registries orchestrated by State officials and urchins preying on the victims some of whom are willing and others unsuspecting, looking for quick fixes to their marital woes and others needing it for more criminal purposes – for emigration and other unspeakable frauds. Suffice to say that we are taking action against the participants in this criminal enterprise in the case of Mrs. A. This got me thinking: how many people are going around believing they are divorced when they are actually still married. Mrs. A completely believed she was divorced and was in a relationship which could have led to marriage (she would inadvertently have committed bigamy and her ‘new’ husband would have been committing adultery with a married woman) before this bombshell. She would not believe me until I produced the letter from the court registry disclaiming the order. I then realized that citizens need more education about how the marriage dissolution process works and decided to pen down a few pointers to how the process works. 1. 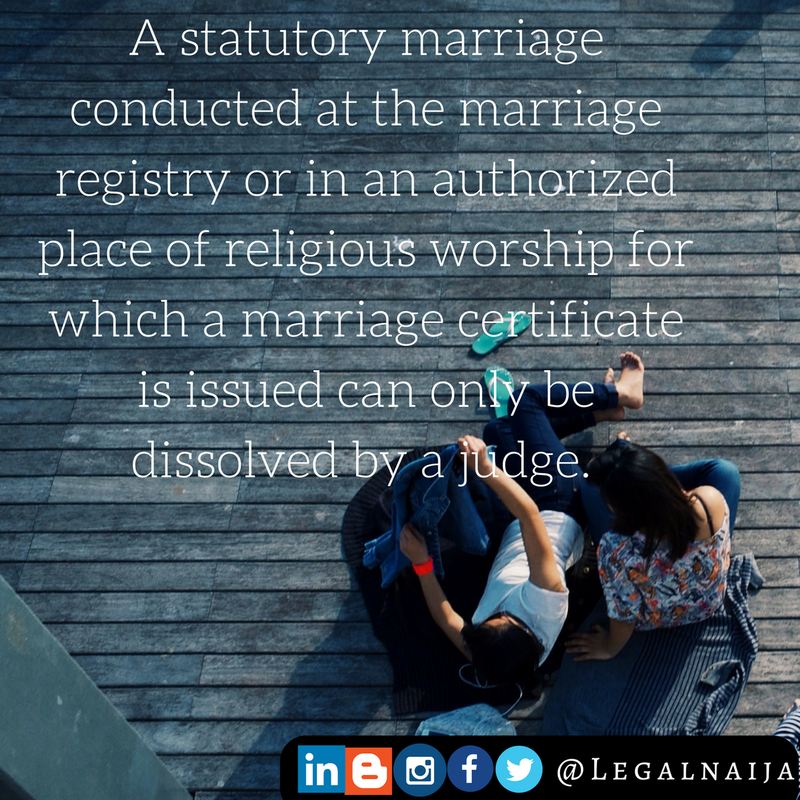 A statutory marriage conducted at the marriage registry or in an authorized place of religious worship for which a marriage certificate is issued can only be dissolved by a judge after hearing the parties on the factors which led to the breakdown of the marriage. If you are given a ‘divorce order’ without having to appear in court, that my friend is a fake divorce. 2. Proceedings for dissolution of a marriage is not complete until arrangements are made for the welfare of the children of the marriage if any and other financial provisions such as maintenance for the party entitled to it, settlement of property, e.t.c. 3. The court is mandated to attempt reconciliation of the parties. This will happen at different stages of the process. Before your lawyer files the suit, he is expected to file a certificate confirming that he has advised his client on the possibilities of reconciliation. During the proceedings, there is a compulsory conference (meeting) which parties must have to explore settlement. After the trial, there is also a three - month window within which the parties may reconcile before the dissolution becomes absolute. Certainly, dissolution of a marriage is not a tea party. 4. Dissolution of a marriage is not conducted at the marriage registry or the court registry. 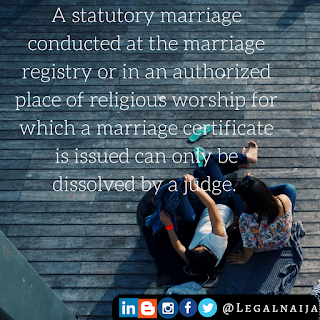 It is done before a High Court Judge in the case of a statutory marriage or before the judges of a Customary Court for customary law marriages. In the case of Mrs. A, she fell into the hands of a fraudulent person at the registry who she called for advice and was told the marriage could be ‘nullified’ at the registry since the marriage was still within a year of celebration! 5. Many people fall into this trap of fake divorces due to privacy concerns. They are more than willing to adopt any measure that does not involve them appearing in court to ‘wash their dirty linens in public’. While a court appearance may be unavoidable, it is important to know the best approach to achieving a dissolution without the sordid details of the marriage. Parties can exploit the no-fault option of seeking dissolution on the ground of living apart for 2-3 years before presenting the petition for dissolution if their case falls under this head. In this way, nobody needs to prove the fault of the other party and the court would dissolve the marriage without an inquiry into this. If you suspect you may have fallen into this trap of fake divorces, my advice to you is to visit the High Court registry to verify the order you have been given. If you find out that you are ‘divorced but still married’ then you will need to go through the process outlined above all over again. I share your pain.